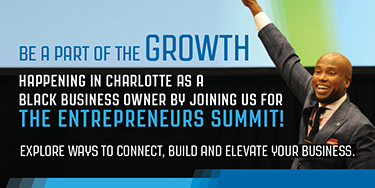 This year BLACK ENTERPRISE celebrates the 45th anniversary of its roster of the nation’s largest black-owned businesses—The BE 100s. To commemorate the significance of this collective’s widespread impact on black business and economic development as well as American industry over four decades, we have presented 45 milestones moments. We now resume this tribute with the continuation of our yearlong countdown. 2003: Ariel Investments, No. 1 on the BE ASSET MANAGERS list and the first black money manager to launch a family of mutual funds, achieves an investment milestone when 17 major corporations select its mutual funds for their 401(k) plans. Led by Ariel founder, CEO, and Chief Investment Officer John W. Rogers Jr., the firm broke new ground with that landmark achievement despite a hypercompetitive environment and greater compliance pressure from the newly enacted Sarbanes-Oxley legislation. Due to the relentless efforts of Rogers, Mellody Hobson, the firm’s president, and the rest of the team, Ariel snared new accounts while applying a value investment style to produce hefty returns for individual and institutional investors. The results: Assets under management grew in 2003 to $16.1 billion, an explosive 58% increase from the previous year. Rogers, listed among BE’s Most Powerful Blacks on Wall Street, has broken barriers in the nation’s asset management industry and helped paved the way for other African Americans to gain entry into a business dominated by non-diverse firms. Like the tortoise of Aesop’s fable, he took a slow-and-steady approach to investing in undervalued small and medium-sized companies over the long term and has built wealth for investors, including millions of African Americans. It was an approach that was in contrast to many of his growth-oriented peers as Rogers would recount in an April 1992 BLACK ENTERPRISE cover story. The journey for Rogers began in 1983 when he launched Ariel Capital Management, now Ariel Investments. 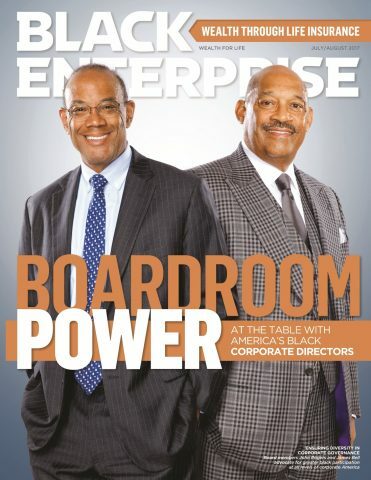 In that 1992 BLACK ENTERPRISE article, Rogers, who worked more than two years for the brokerage firm William Blair, used a connection to gain his first account: $100,000 investment from the Howard University endowment fund. He also developed The Patient Investor, a newsletter describing his stock-picking philosophy —complete with a picture of a tortoise and the “slow and steady” tagline gracing its cover. Due to his performance, assets under management grew to $2 million by 1986. As Rogers built his mutual fund family—the first was Ariel Fund—he brought on Calvert Group Inc., a financial services company, in 1986 to serve as the distributor and transfer agent. Yet eight years later, in a bold move to gain independence, he paid $4 million to separate from Calvert and assumed responsibility for all operations. “We went from managing $2.3 billion to $1.1 billion over a short period of time, and it was extraordinarily uncomfortable and frightening,” Rogers told BE at the time. Ariel persevered through such rough patches and learned valuable lessons from business volatility and severe market downturns, including the financial crisis in 2009. Rogers, an investment icon and former captain of the basketball team when he attended Princeton University, has repeatedly demonstrated his resilience. 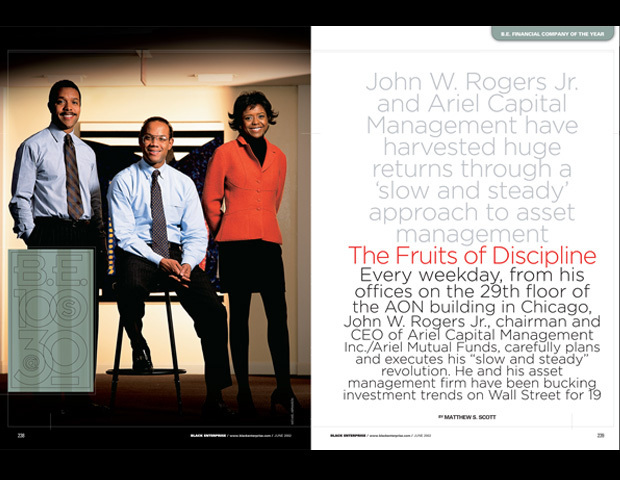 In 2010, Crain’s Chicago Business reported Ariel emerged from the financial crisis with its best performance ever. The firm’s flagship Ariel Fund rose 56% for the past 12 months, beating the 38% average rise for rivals, according to investment rating firm Morningstar. Most recently, as of Sept. 30, 2017, the Ariel Fund produced an annualized return of 11.34% since its Nov. 6, 1986, inception date, according to Ariel’s website. That compares with the same period for the Russell 2500 Value Index, a 10.86% return for the Russell 2500 Index, and a 10.32% return for the S&P 500 Index. With offices in New York and Sydney, the Chicago-based Ariel offers investors six no-load mutual funds and nine separate accounts, and as of Feb. 28, 2017, the firm reported assets under management of $11.5 billion. When not operating Ariel, Rogers and Hobson have been active in the business, philanthropic, and social fronts. 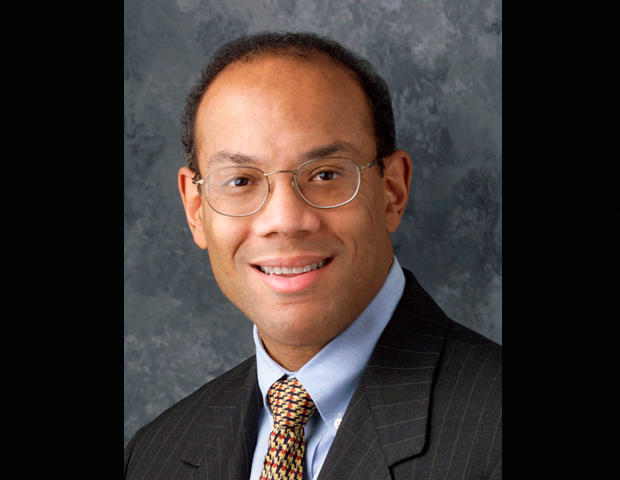 For instance, Rogers, a board member of McDonald’s Corp. and Exelon Corp., and Hobson, who serves on the boards of Starbucks Corp. and Estée Lauder Cos., can be found on the BLACK ENTERPRISE Registry of Corporate Directors. As such, they represent some of the fiercest advocates for diversity in corporate governance. Despite the milestone that Ariel achieved some 14 years ago, Rogers is still actively fighting for greater opportunities for black firms to gain access to opportunities to manage corporate, pension fund, and endowment dollars. According to a 2015 Wall Street Project Asset Management study released at the annual summit created by civil rights leader Rev. Jesse L. Jackson, minority firms have been unable to gain a foothold in a sector in which assets under management totaled a whopping $68.7 trillion and profits grew to $93 billion in 2013. Using data from the BE ASSET MANAGERS list, the study further revealed that top black firms manage a total of $118.4 billion in assets—a mere 0.3% of the total $36 trillion in domestic institutional assets under management. Rogers believes greater boardroom diversity will make the difference in the creation of a more equitable asset management selection process. It is fitting, however, that Ariel has been able and will continue to break barriers in asset management, in great part, due to Rogers’ vision, tenacity, and investment prowess. In 2013, he was featured with legendary investors Warren Buffett, Sir John Templeton, and Benjamin Graham in the book, The World’s 99 Greatest Investors.